Scientific and Demonstration Posters are required to be displayed physically onsite in Cincinnati, Ohio and submitted as an E-Poster. The deadline to submit your E-Poster September is 19th. Please ensure your poster is in person-first language and does not include any brand names. Download the flyer and brochure for more details on person-first language. Your poster number can be found at http://www.aacpdm.org/meetings/2018/program/posters. All e-posters uploaded by September 19th will be considered for the Best Scientific or Demonstration poster awards. E-Posters must be submitted using either the PowerPoint Template. Templates will also be available to download as an optional task in the Speaker Harvester. Once you create a one slide poster (either in PowerPoint or Keynote), save the file as a PDF, and upload your file to the Speaker Harvester. 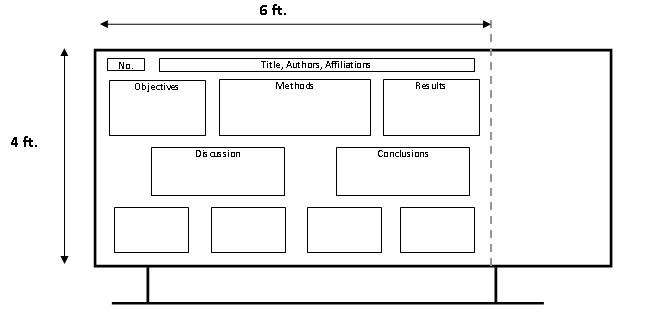 A sample E-Poster layout is below for your convenience. If you would like to use this layout, please download this template. The maximum size of a traditional paper poster is 4 feet tall (vertical) by 6 feet wide (horizontal). The AACPDM will provide poster boards which measure 4 feet tall (vertical) by 8 feet wide (horizontal) that will hold 1 poster on each side. The heading for the poster should include the title, author(s) and affiliation. The heading must be mounted at the top of the board. Lettering should be large enough to be read from a minimum distance of four feet. Please include contact information or business cards attached to your poster for attendees to contact you at a later date. In preparing and presenting your poster, please keep in mind that your audience may represent many disciplines and perspectives, including physicians, therapists, researchers and parents. Tacks or push pins for attaching your poster to the board will be provided.